Email has undoubtedly become a key tool for communications among companies worldwide. However, with frequent virus attacks and the alarming rate that spam has been filling up inboxes, email is quickly becoming a less efficient means of communicating. In fact, the Radicati Group, a market research firm in Palo Alto, California, predicts that by 2007, there will be 50 billion spam messages each day, costing companies almost $200 billion per year. This is simply astounding and unacceptable. It's time to take control of spam. 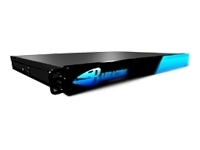 The Barracuda Spam & Virus Firewall is an integrated hardware and software solution that has the power of an enterprise-class solution, and the ease-of-use and affordability that businesses of all sizes demand. Designed by a team of veteran networking engineers, the Barracuda Spam & Virus Firewall is a powerful, enterprise-class solution, supporting 25,000 active email users and handling 25 million messages each day. Its architecture leverages open source virus and spam solutions in conjunction with ten defense layers: denial of service and security protection; IP block list; rate control; virus check with archive decompression; Barracuda virus check; user-specified rules; spam fingerprint check; intention analysis; Bayesian analysis; rule-based scoring. This architecture optimizes the processing of each email, which yields the performance required to process millions of messages per day. Unlike software solutions, the Barracuda Spam & Virus Firewall reduces the load placed on the email server by off-loading both spam and virus filtering. With no software to install and no modifications required to existing email systems, installation is extremely easy, typically taking only five minutes. Once installed, the system administrator uses an intuitive web interface for monitoring and maintenance. The Barracuda Spam & Virus Firewall requires minimal maintenance because its innovative design incorporates reliability into every aspect of the product. Energize updates are automatically retrieved by the Barracuda Spam & Virus Firewall, enabling maximum spam and virus protection while eliminating administrative overhead. These updates are provided by Barracuda Central, an advanced technology operations center where engineers continuously monitor the Internet for trends in spam and virus attacks.